What are the different wedding photography styles? Fine-art wedding photography involves using artistic angles, creative lighting, unique compositions and advanced post-production techniques to create imagery with a much stronger artistic flare. As wedding photographers we are very meticulous about researching scenes and anticipating moments so that we can use fine-art techniques, without interfering with our surroundings. Fashion photography is a genre of photography, and that focuses around displaying clothing and other fashion items for commercial purposes. This style of photography is popular in large metropolitan areas such as Los Angeles. However, there are several unique photography techniques that are employed in fashion photography, which we borrow from in our wedding photography style. These techniques include the usage of unique off camera lighting, fashion-esque poses and expressions, along with dramatic backgrounds. Typically, our fashion influenced the style of wedding photography will only be used at the request of the bride and groom during the engagement shoot/bridal shoot, as it does require plenty photographer involvement as well as sometimes complicated lighting setups that need time to make happen. Traditional wedding photography typically has quite a bit of wedding photographer involvement. The wedding photographer is seen almost as a type of coordinator, and thus, assists in guiding and directing the wedding. While Nat and Bryan are not traditional wedding photographers, we do have extensive experience in directing and posing people for group formals when necessary. However, in general, our philosophy is to capture real moments and to remain as unnoticed as possible for the majority of the day. Honestly, we are a little bit of everything. We shoot a mixture of light & airy as well as dark & moody to best tell the story of your day. For the majority of your day we are photojournalists. Capturing the day as it naturally unfolds without being obtrusive or directing you, your families, or your guest's natural interactions with each other. However, when it comes to the bride and groom portraits time of the day, we make the switch to fashion & fine art you allow us plenty of time to make sure you look perfect by giving plenty of direction for amazing, beautiful pictures of you and your loved ones. This can also be achieved by choosing to do a post wedding session if you prefer not to take the time needed to create these types of images. 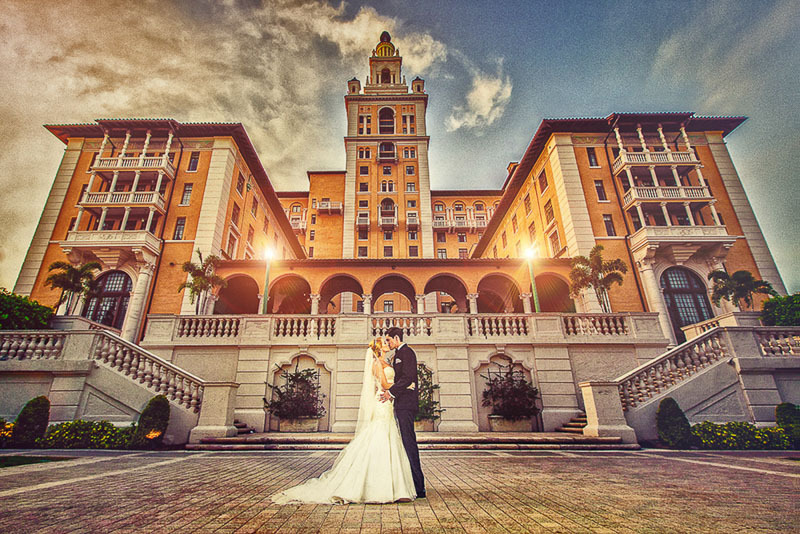 Miami Wedding Photography can by tricky in the sense that at any moment a thunderstorm can flare up. Specially during the wet season. That is why we give our couples the peace of mind that if it rains, the post session is on us, guaranteed.